The parish was in the Burgh sub-district of the Spilsby Registration District. You can also perform a more selective search for churches in the Bratoft area or see them printed on a map. The Anglican parish church is dedicated to Saints Peter and Paul. The church is built from sandstone with a brick tower. The church (with the exception of the tower) was restored in 1890. There is a photograph of Saints Peter and Paul Church on the Wendy PARKINSON Church Photos web site. Richard CROFT has a photograph of St. Peter & St. Paul's Church on Geo-graph, taken in February, 2006. The Anglican parish register dates from 1685. The Lincolnshire FHS has published several marriage indexes and a burial index for the Calcewaith and Candleshoe Deanery to make your search easier. Kelly's 1900 Directory of Lincolnshire places the parish in the rural Candleshoe Deanery. The parish has also been listed as being in the Loveden Deanery. Bratoft is both a village and a parish not far from the coast of Lincolnshire, lying 5 miles east of Spilsby. 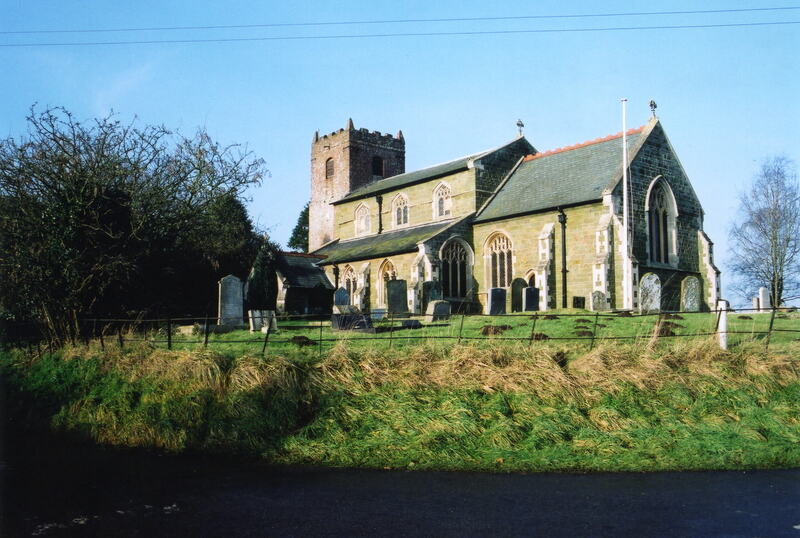 Burgh le Marsh parish lies to the north-east and Irby in the Marsh parish to the south-west. The parish covers about 1,800 acres. By automobile, take the A158 trunk road between Horncastle and Skegness. The parish is just south of the A1028 junction. See the Lincolnshire Touring and Holidays page on this site. Ask for a calculation of the distance from Bratoft to another place. You can see the administrative areas in which Bratoft has been placed at times in the past. Select one to see a link to a map of that particular area. In the church tower hangs a painting by Robert Stephenson of a fancifil defeat of the Spanish Armada. 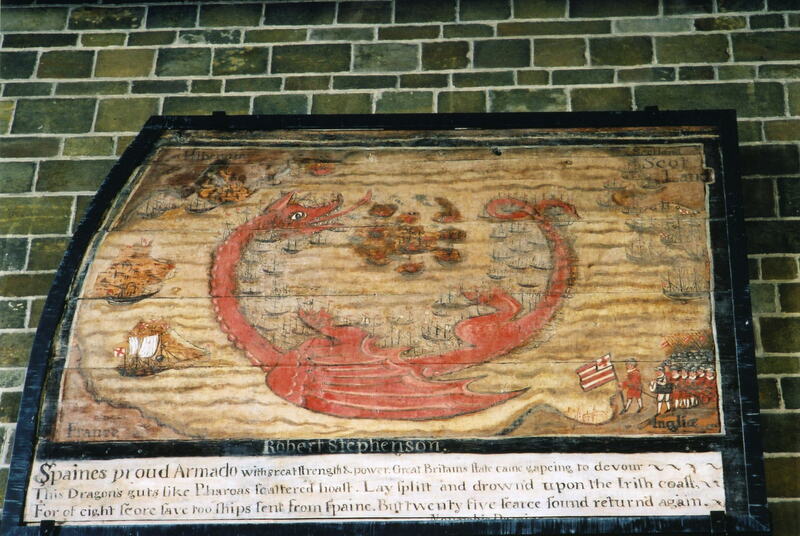 The Armada is depicted as a giant red dragon. Bratoft Hall was taken down in 1698. It had been the ancestral home of the family MARKHAM. The MASSINGBERD family replaced the MARKHAMs as owners of Bratoft Hall. The parish was in the Wold division of the ancient Candleshoe Wapentake in the East Lindsey district in the parts of Lindsey. Kelly's 1900 Directory of Lincolnshire places this parish, perhaps erroneously, in the South Lindsey division of the county. The 1913 edition does the same. For today's governance, see the East Lindsey District Council. As a result of the 1834 Poor Law Amendment Act, the parish was became part of the Spilsby Poor Law Union. The children of this parish attended school in Irby in the Marsh.